Android App to Answer Bengal Farmers' Questions! West Bengal farmers are set to get more mobile technology to their aid with the government releasing an Android app that will deliver expert opinions when needed. This is a new initiative by the state government to reach out to the grass root level farmers who couldn’t have otherwise consulted top notch agricultural pundits for better farming instructions. The app named Mati Katha was developed a budget of Rs 2.39 Crores (first phase) by agricultural experts in association with the state information technology agency WEBEL. Initially a team of 127 workers recruited under Krishi Proyukti Sahayak scheme will reach out to farmers in six districts of the state which are Burdwan, Nadia, North 24-Parganas, Hooghly, Bankura and Jalpaiguri. The agents armed with the app will reach the farmers who can then talk to the experts via video conferencing and get answers for their problems directly from the experts. The app can also help make budgetary plans for various crop harvests, get insights about market price and weather forecasts as well. The success of the project largely depends on the internet penetration of the areas it is currently targeted at. High speed internet penetration is not very promising, however, the 2G networks can still be a ray of hope and the state department executives claim that the apps are designed to work fine with low internet speeds. The “Mati katha” initiative surely is a nice gesture from the administration. And it also shows how ubiquitous internet access can influence different sectors of the economy that rarely has a connection to it. The app is not currently available for public download. 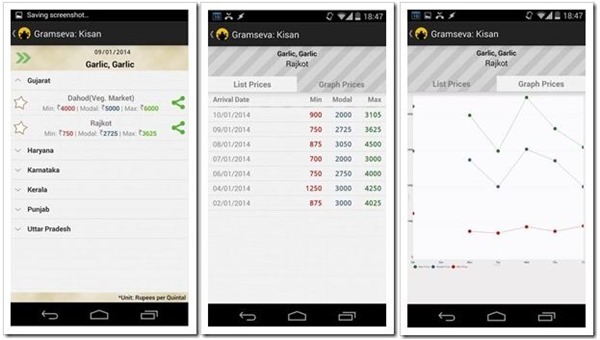 Although if you are looking for similar apps that can help Indian farmers you can try the following Android apps. 1. Digital Mandi India: Gets you sell rates from the markets. 2. GramSeva Kisan(Mandi Prices): This also gets you the rates. However, the data is fetched from the government sources like http://data.gov.in. It also has a nice offline storage feature which lets you use it even without internet. It has a nice graph that gives more meaningful insights. 3. Agriportal: Surely the best in my view, however, the reviews are a little on both sides. It has prices in a nice organized way. It also comes in multiple languages and has the weather report option in it. If the Mati Katha venture is a success, it will enable a large number of farmers take calculated and informed decisions and eventually with best use of resources yield better and more crops which will certainly boost economy for West Bengal(and India). More about the Mati Katha initiative by the West Bengal Government. these kinds of stories alone make the people of the nation feel hopeful about its future. Glad that there are people making an effort to secure the interests of farmers and agriculturalists.